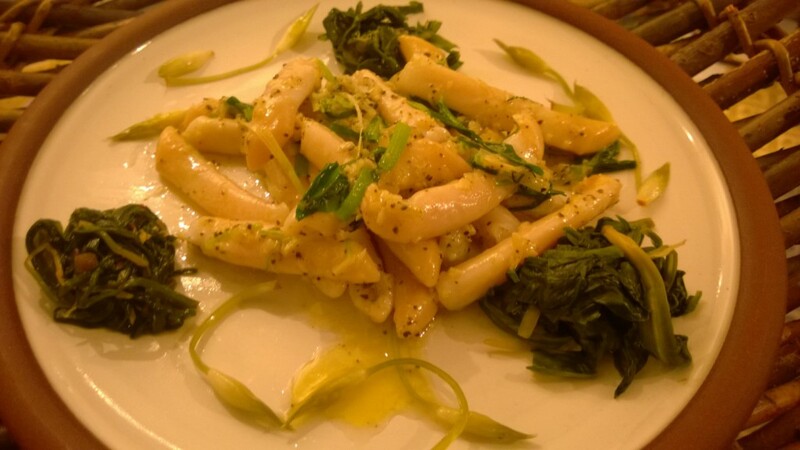 Fermentaion is the oldest, simplest and arguably tastiest means of preservation known to man. There isn’t a culture that doesn’t have a fermented preparation near the heart of its food culture – think kimichi, soy sauce, saurkraut, beer, yogurt, sourdough…the list is endless. I’m not going to go into this vast world here – check out Sandor Katz’s excellent website and books for a breath-taking introduction to the art, craft and science of fermentation in all its guises. 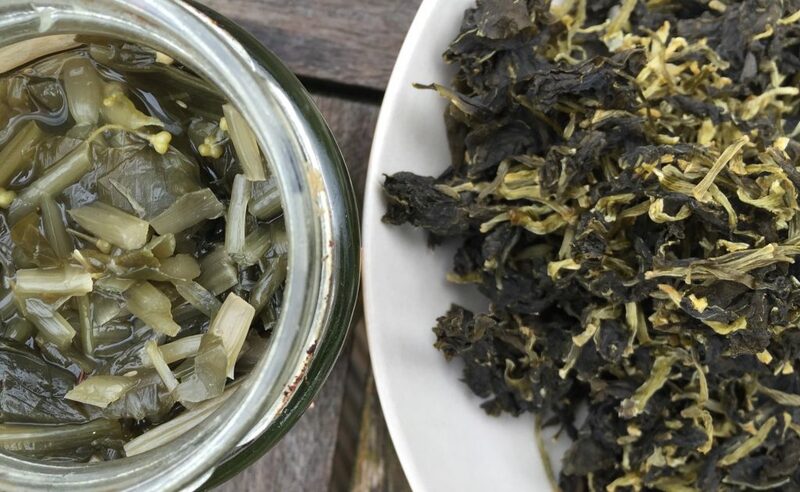 I just want to describe a simple preparation that turns some already tasty wild foods into something truly delicious that is even better for you than the original, and keeps really well. Better still, you need next to no ingredients. Many people that seem to be happy to spend money on expensive “probiotic” drinks (that look and taste like pus), under some vague understanding that they are good for them, balk at the idea of fermenting plants. Stepping from a world governed by “use by” dates and built-in food-waste to one where natural flora and bacteria are encouraged to “pre-digest” our food is an understandably big step. But it is an important and hugely rewarding step and I urge anyone to take it for gastronomic, health and even spiritual reasons! It is well worth remembering that humans are not one creature, but complex array of mutually beneficial organisms – especially when it comes to digestion. I’m not professing to be an expert on this science/craft/art. I have a standard “dry” fermentation preparation that works extremely well for me and is always a huge hit on my walks and with chefs I work with. I say “preparation” rather than recipe because there really is no recipe – follow the steps, experiment, find out what works for you. Far better than following somebody elses tastes. I describe it as “dry” fermentation because, for the most part, I add no liquid – the plant matter ferments entirely in its own juices. “Wet” fermentation follows a similar process, but the plants are added to a brine. I prefer dry fermentation where possible as their is no dilution, only enhancement, of flavour. Enough introduction – here are the steps to follow – I suggest you just have a go and see what you think – there is no large outlay of time, effort or ingredients required. This may seem like a lot of steps, but they are all very easy and require only your green matter for fermenting, a little bit of salt and some clean jam jars or a kilner. Don’t be scared! I have listed some trouble-shooting steps at the end and some suggestions of how to use your ferments. 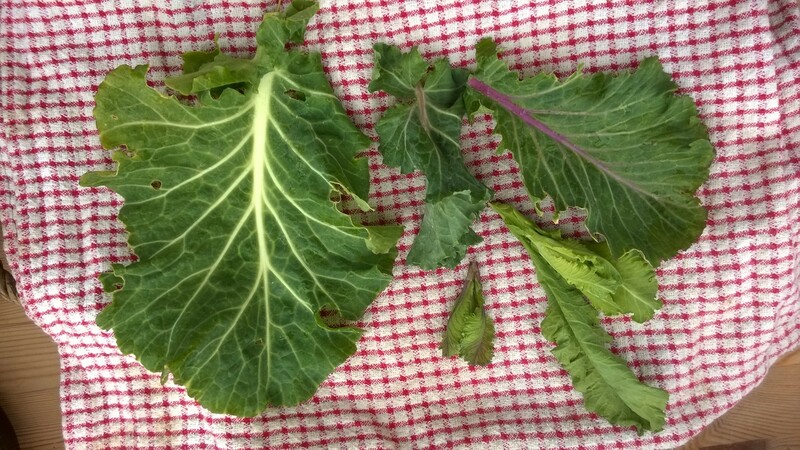 I recommend you start with something you can gather quickly and easily in decent quantities. Wild garlic or other edible alliums like few-flower or three-corner leek are excellent candidates. They are easy to come by and, while tasty enough fresh, have quite a one-dimensional flavour that becomes much more complex when fermented. You could also try cow parsley, nettle, ground elder, sea beet, sea aster, wild cabbage, sea radish, garlic mustard, common hogweed or any green, leafy wild plant. If gathering plants with a lot of stalk, like cow parsley, you can include all but the toughest stems. 2. Round up enough of the plant you wish to ferment. How much is enough depends on how much you’d like to make, the plant you are using and the vessel you wish to ferment it in. Going on wild garlic, if you want to fill a 1 litre kilner, you will need a surprisingly large amount – a well filled carrier bag. A quarter of that would do for a standard jam jar. The plants you use should be squeaky-fresh – I don’t recommend this process to “rescue” stuff thats been lurking in your fridge for a week. 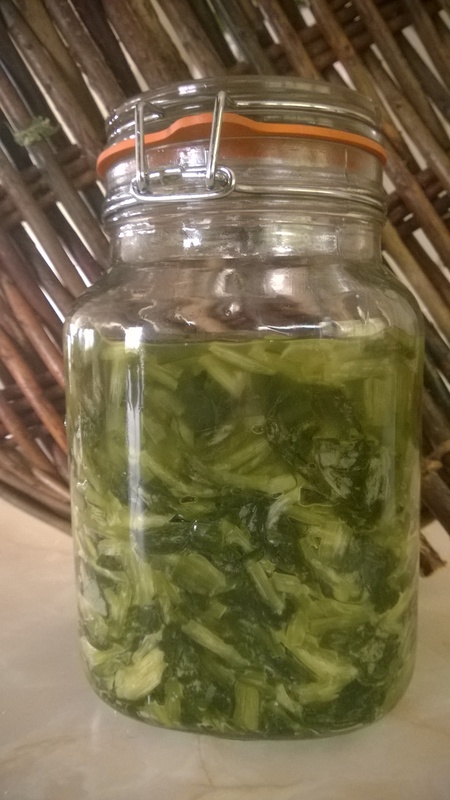 For the rest of this process, i’ll be referring to making your ferment with wild garlic. 3. Wash the plants and remove excess moisture. A quick whizz in a salad spinner will do – you don’t want the plant dripping in tap water – it contains chlorine and additives that inhibit fermentation. You could leave wild garlic, nettle, sea beet etc leaves whole – this is mostly a matter of preference. I suggest shredding as this makes it easier to spoon the finished product out of the jar later. 5. Place the shredded plants in a large open bowl, a few handfuls at a time. If you are only fermenting a small amount, it can all go in the bowl at the same time. It is important to remember that the salt is not a preserving agent in this process, merely a means of drawing out the leaves’ natural juices – think aubergines, only here you want to keep those juices. 2% – 3% salt by weight is more than adequate for this process. If you are like me, you will be tempted to add too much salt first time around. This is OK, you’ll just have quite a salty ferment and not add so much the next time. 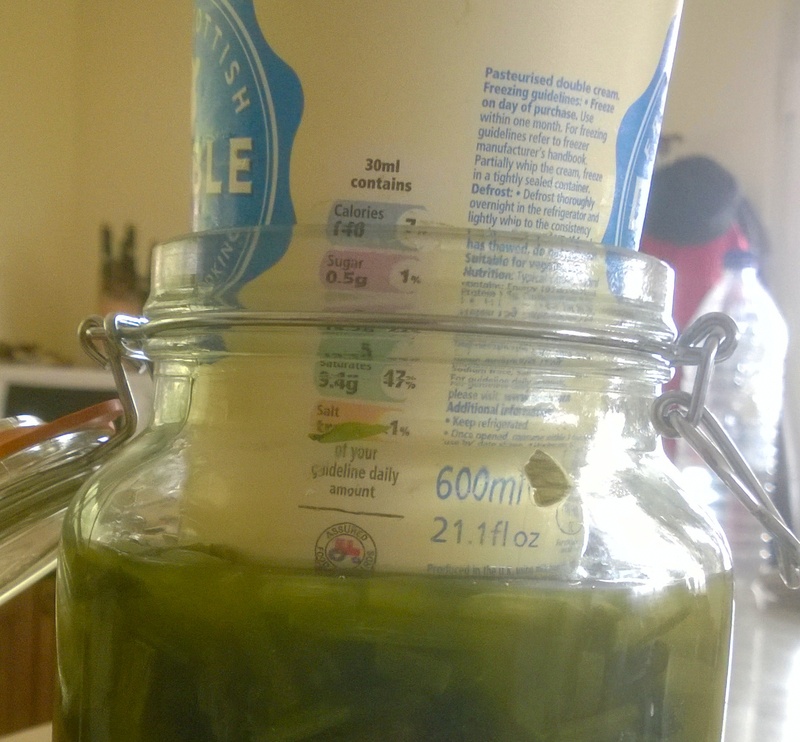 Translating into simpler terms, for a carrier bag of wild garlic to fill 1 kilner once fermented, I add about 1.5 teaspoons of salt – sprinkling a little on each layer then adding more leaves and sprinkling again. It is possible to ferment without adding any salt at all – but I suggest leaving that until you are more confident with the process. 7. Leave to stand for 20 to 60 minutes in ambient temperature. This allows the salt to start its work drawing the juices from the leaves. 8. Massage the salted, shredded leaves. Give them a good rub/massage with your hands until they darken, become wet and start to lose their form. 9. Leave to stand for at least 60 minutes, or overnight. Weighing the leaves down with a plate can help get the juices flowing here – but its not essential. 10. Pack the leaves firmly into a glass or earthenware vessel. Ensure the vessel is clean. Jam jars work fine, or kilners if you are doing a larger amount. Traditional fermenting crocks are made for the job – lucky you if you have one as it makes the next stage a lot easier! As you add the leaves to the vessel, champ them firmly down with the end of a spoon or rolling pin or the like – it is important to avoid air pockets between the wet leaves. By the time you have three quarter filled the vessel with champed down plant, you should be aware of plenty of juice. If you are packing into multiple vessels, ensure you add the liquid left in the bowl evenly to top up each vessel to about three quarters full. When your vessel is about three quarters full, press firmly down on the leaves. There should be enough liquid to cover the leaves. If there isn’t, ensure you have evenly distributed liquid if you are using multiple vessels. If you cant get the juice to cover the leaves, add some natural, uncarbonated, mineral water – DO NOT be tempted to add tap water, as the additives inhibit fermentation. 12. Weigh the leaves down in the vessel. Fermentation must take place in an anaerobic environment – ie. with no air present. So now you need to find a way to keep the leaves weighed down beneath the level of the liquid in the vessel. Traditional fermenting crocks have specially designed lids for this very purpose. I don’t have one, but fortuitously, a standard jam jar or large yogurt pot is just the right size to sit inside my kilner jars, and tiny yogurt pots or jars are often the right size to fit inside standard jam jars. So play around and see what you come up with. Typically, a jam jar filled with water (or, cunningly, another ferment) should be enough to keep your fermenting leaves submerged. This stage is important – do spend some time ensuring that your ferment is sealed by liquid from the air. 13. Leave to ferment at an ambient temperature. Resist all temptation to put the ferment in the fridge. The helpful bacteria that will preserve and give character are dormant at low temperatures. Do not be alarmed by white froth/bubbles forming – this is a normal part of the fermentation process. You can scrape the froth off if it disturbs you! Blue mould, blackening or a “cheesy” smell are not good signs – see below for trouble-shooting. 14. How long to leave the ferment? Leave it to ferment at ambient temperatures for at least a week, but as long as you wish. You can dip in and taste on a regular basis until you are happy with the flavour. 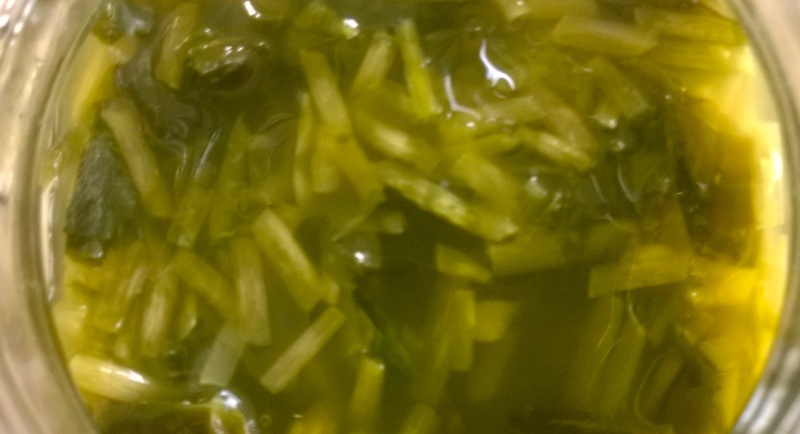 After a week you should notice the characteristic slightly “fizzy” mouth-feel of all lacto-fermented greens (if you are not sure what this sensation is, buy any half decent saurkraut from the shops and taste that) . The greens should retain a surprising crunchiness for something that looks so wet and wilted. 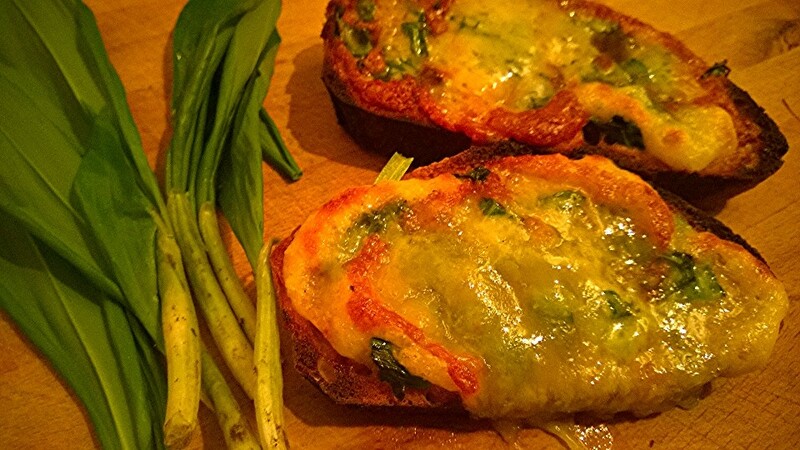 The sharp, pungent flavours (of wild garlic for example) should have mellowed into a rounder, more complex flavour. When you are happy with the flavour, remove the weighing-down item, put on the lid and keep in the fridge. If you have fermented in a large vessel, its best to re-jar the ferment in smaller jars for storage – this keeps air exposure to a minimum, especially if you ensure there is a covering of liquid. The ferment should keep well for several months in sealed jars, but consume them within a couple of weeks once you start using the jar. If you are new to fermenting, I expect you will feel a bit anxious that the ferment will go “off”. I have never had any problems with the method above, except when I topped up a common hogweed ferment with tap water. The top level went black and it developed an unpleasant smell that was instantly recognisable as “off”. Observe your ferment and trust your senses. Blue mould, blackening and a cheesy smell are bad signs and usually occur because you haven’t created anaerobic conditions and/or your vessel/plant matter wasn’t clean. All may not be lost however: you can scrape off the top mouldy layer, top up with uncarbonated mineral water and give it another chance. The simple alchemy of this preparation is part of its charm, but it is easy to add a few twists. 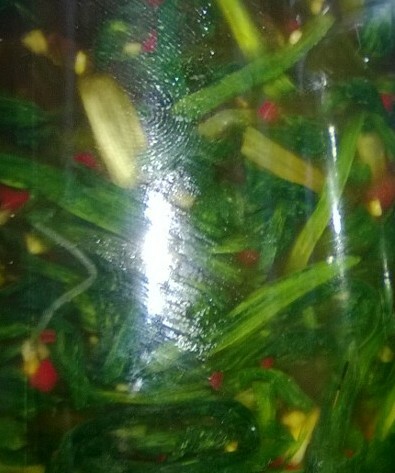 Try adding nam pla (fish sauce), chilli and ginger to make vietnamese style kimichi. 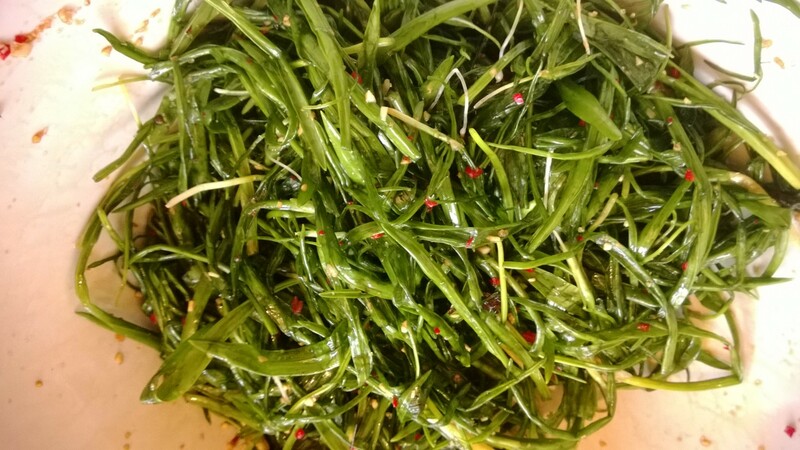 Green hogweed seeds, sea rocket or wild garlic/leek capers add a bit of extra kick. I make a salty fermented fish sauce from spoot clam offal (garum) which I use instead of salt for fermentation – it adds an extra meaty umami oomph. Play around! Don’t waste the fermenting liquid – add it to salad dressing, sauces etc or just drink it. I particularly like tequila and fermented wild garlic juice shooters. The Art of Fermentation by Sandor Katz is the go-to book on this subject. He has a website too. These are excellent instructions, clear and uncomplicated – thank you for that ! I have been a ‘forager’ for a long time and have been wondering how to proceed to the next level, I am starting immediately ! 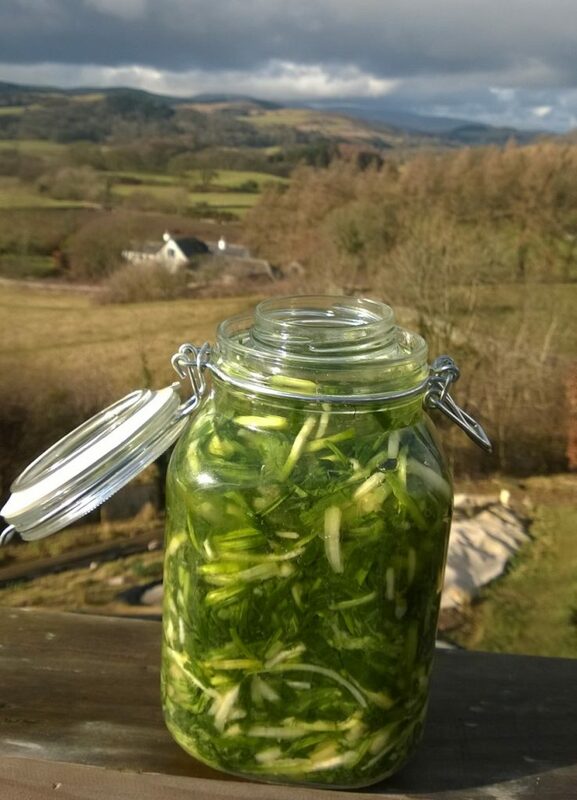 Geat article and perfect timing for all the Wild Garlic I currently have around me..now just need to find a few more jars..
V Good site – appreciate it. I’m learning a lot about foraging. Been fermenting veg for a year or two now. Just slightly puzzled as to why you don’t fill the jar totally so that putting the kilner lid down actively pushes liquor out. Admittedly it does mean you have to stand the jar/s on some kind of catch tray because it fizzily farts round the seal as the anaerobes do their wonderful work but you are at least certain of only anaerobic breakdown. I can fit two 1litre kilner jars in a large old tupperware type container. This then goes inside a slightly larger tin – had one of those awful dry italian cakes in received years ago as a Christmas present – and the lid goes on to exclude light. Not strictly necessary but recommended. So far never had any failure. Use mainly home grown or shop bought organic veg of various kinds but you have inspired me to try with foraged food. Thanks, glad you enjoy the website. This sounds like it works for you – thanks for the tip. My main priority is to ensure anaerobic conditions. The best thing I’ve found is a small plastic “basket” that came in a shop-bought jar of pickles. Great instructions thank you. Just got my 1st batch going! Very interesting! Do you add the fish sauce in the beginning pre-fermentation or once it’s ready to put in the fridge? If in place of salt what ratio fish sauce do you find best? Hi galen, Add at the beginning. I haven’t really measured it – its not critical. I rinse jars with boiling water (carefully, so they don’t crack with the heat! ), but don’t go through full sterilisation. There is no need to freeze once fully fermented as the plants will keep indefinitely – i’m still eating last year’s ferments, which have not been refridgerated. Thank you for such clear instruction and your generosity of sharing what you have learned. Fermenting has always been done at home when I was a child, my mother fermented sauerkraut, green beans, runner beans and other vegetables. But they where never kept in the fridge but in the cellar in large stone pots with a wooden lid weighed down with a heavy stone.The lit rested on top of the vegetables which where covered with a muslin cloth. This was replaced with a new clean one each time we took something out of the vessel. So, my question is, do I really need to keep any ferments in the fridge? No, you don’t, not when they have fermented and reached a level of acidity that inhibits mould/spoilage. What you do need to do though, and this is where your mother’s set up worked, is keep the preserved materials submerged in the fermenting juices, and free from fruit flies (which the smell of fermentation attracts). While plants are still fermenting they emit CO2, so shouldn’t be kept airtight. Great recipe Mark! Really like this recipe. 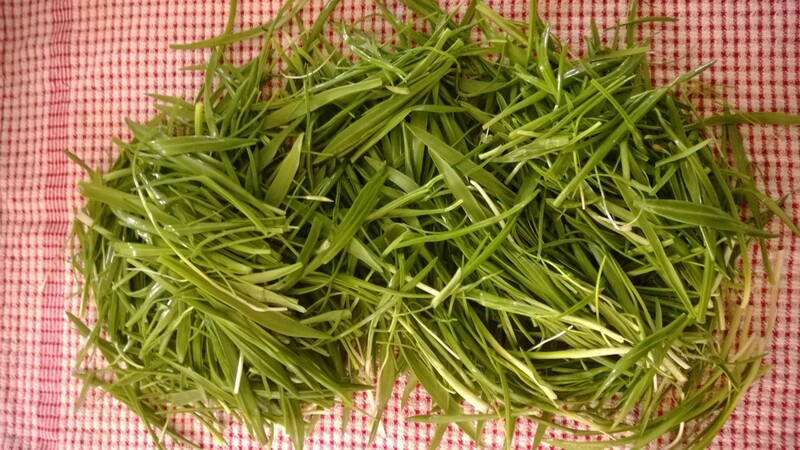 I have just identified a patch of few flowered leeks that I am going to use in this recipe. Can’t wait to try them under cheese on toast!